What’s one of the worst things about owning cats? Cleaning out the litter box, right? No one likes to do it and yet it has to be done so frequently. For a lot of cat owners, it’s needed every day, depending on the type of litter you use. But it can be a hassle, which is why the best self-cleaning litter boxes could be a huge bonus for you, making your job a whole lot easier. And who couldn’t use a little bit easier chore? This self-cleaning litter box buying guide will get you started. Multi-Cat: Do you have more than one cat? Well then, you’ll want to make sure that the box you choose can handle all of your cats. If you overload it and have to do it yourself you might as well not have one. Automatic: The whole point is that you don’t want to clean out the litter box yourself, right? So getting something that takes care of the process with no input from you is really the best way (or as little input as possible). Dimensions: The size of the litter box is important so you know if your cat is going to comfortably fit and so you can plan where it’s going to go in the house. Size most definitely matters in this instance, to you and your cat. Flushable: Did you know that some boxes allow you to flush the contents? Well, they do and whether or not yours does is entirely up to you (if you’re watching anyway) so make sure to take a look at this option. Power: Do you need electricity? Batteries? Nothing at all? You are going to want to know before you bring that litter box home and try to use it. This will help you pick something that really works for your needs. Warranty: Warranties are great because they let you know whether something is durable and whether the company stands behind it, so we’ll take a look at how long the warranty is to help you choose a good product you can trust. There are a lot of options out there when it comes to a self-cleaning litter box, so make sure you pick something that is going to get the job done. But how will you know? Well, we’ve done a lot of the work for you, so you don’t have to worry about trying to figure it out. Just take a look at these and you’re going to be off to a great start. Whether you have an idea where to begin or not, you’re going to be off to the races with these self-cleaning litter box reviews. 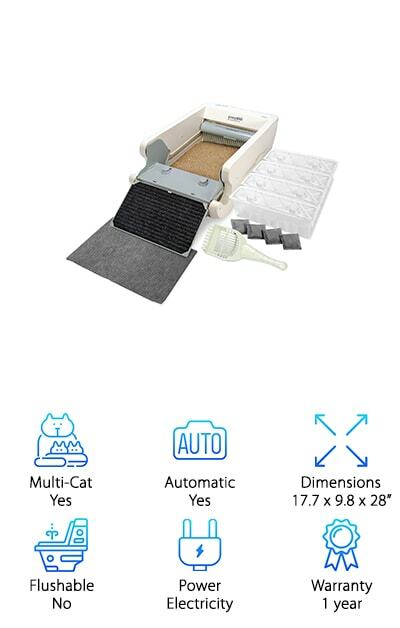 When it comes to our top pick we love the CatGenie Self Washing Cat Box, the best self-cleaning litter box for multiple cats. 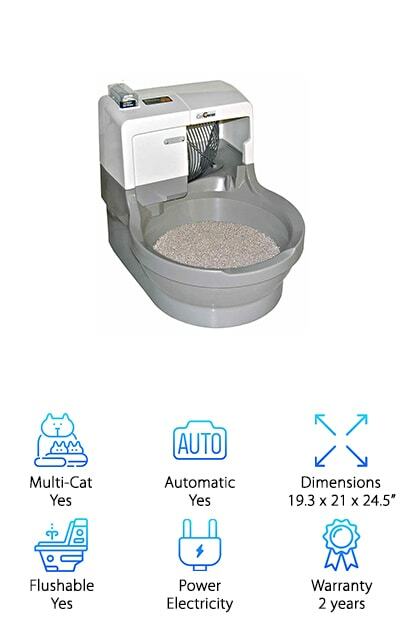 The system actually flushes waste out of the box and uses washable granules that still allow your cat to follow their instincts for digging and cover their own mess. 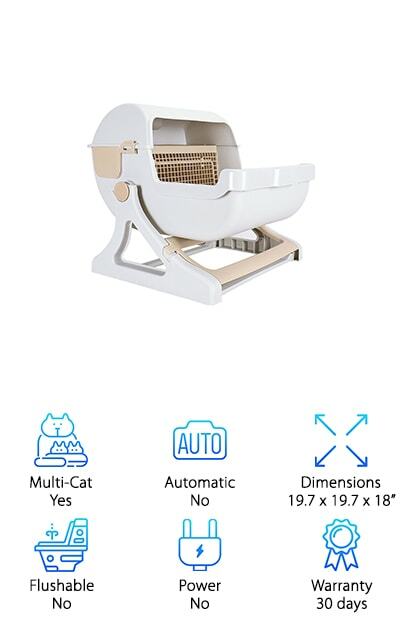 Designed for up to 3 cats to use it needs to be connected to cold water as well as electricity in order to function properly. It’s completely dust free and can be reused as long as you want, plus the granules are septic safe. All you need to do is hook it up once and program the cleaning schedule that you want. At the preplanned times, it will take care of cleaning out the box and sanitize the remaining granules. There’s no need to carry litter or clean out the dirty litter either. What’s really nice for your cat is that it dries the granules once it’s done cleaning to make sure they’re warm and ready to go. Our favorite budget pick is the Omega Paw Self-Cleaning Box, which comes in two different sizes and actually closes entirely so you don’t even have to look at it. There’s no need for liners, filters or electricity. Instead, it rolls to the side to drop any waste material into the pullout tray. Then, you just remove the tray and dispose of it. You won’t have dust, odors or any of the other problems that go along with trying to clean your box. That makes it safer for everyone in your family (and more comfortable while you’re at it too). This box actually works with larger cats and even for several cats. You can also count on the overall durability because it offers a one year warranty. If your cat doesn’t like the cover over the top you can also remove it and still use it with no problems. Just be a little more careful when you roll it for cleaning. The PetSafe Litter Box takes care of cleaning for up to several weeks so you don’t have to. It does this by absorbing liquid waste and dehydrating solid wastes while using a covered trap to lock it all away. That means you’re not going to smell the waste either, even while it’s still there. Not only that but it has a disposable and leak proof tray system that includes a lid so you don’t have to worry about the mess while you do get rid of it after the time is up. 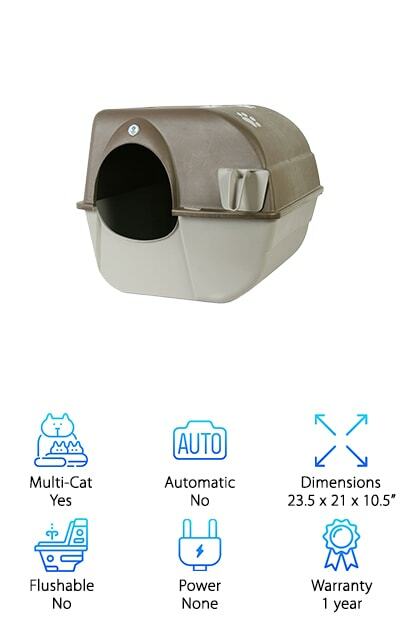 Large enough for your full size cat and compatible with an additional lid to cover the top if you want to keep it out of the way. Once your cat uses the litter box it starts the process of cleaning and in 20 minutes it’s completely ready to go again and you won’t smell anything. After a few weeks, you can simply pull out the disposable tray and throw it away, just like that. The Nature’s Miracle Self-Cleaning Box provides odor controlling receptacles as well as carbon filters that are designed to cut through as well. It does this with antimicrobial products that help to eliminate the bacteria that causes those odors. Each time that your cat uses the box it automatically cleans itself out. Even better, you’ll be able to use your current litter with the box, there’s no need to change. There’s a one year warranty that says it’s going to last and continue to work the way you need it, with no problem. 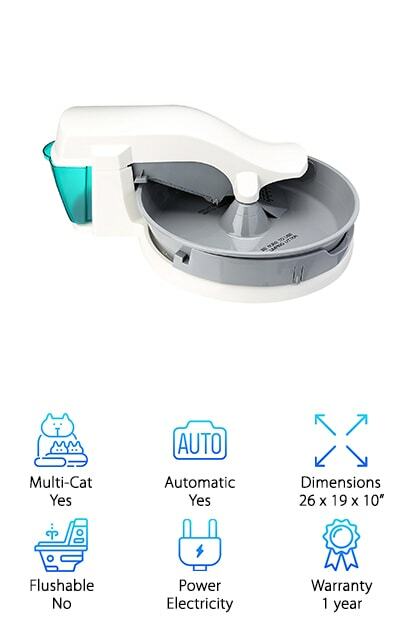 If you have several cats you’ll have no problem with using this system because it still makes sure that everything is clean and you don’t have to worry about smelling or seeing any mess. It’s a great self-cleaning litter box for multiple cats. If you really want to keep from seeing it you can also purchase a separate lid to cover the box and keep your cats mess even more secure. The ScoopFree Litter Box comes in two different colors so you can find something you’ll enjoy and so will your cats. It uses crystal litter which can absorb urine and helps to get rid of odor at the same time. When there is any kind of waste it also rakes it into a compartment to make this even easier. When it comes to cleaning it out you can quickly and easily take out the litter trays and rely on the leak-proof lining to make sure everything is sealed in. The entire box is even covered to make sure you get even less odor and that your cat can feel even more comfortable. What’s really unique about this box is that it actually counts how many times that your cat uses the box. 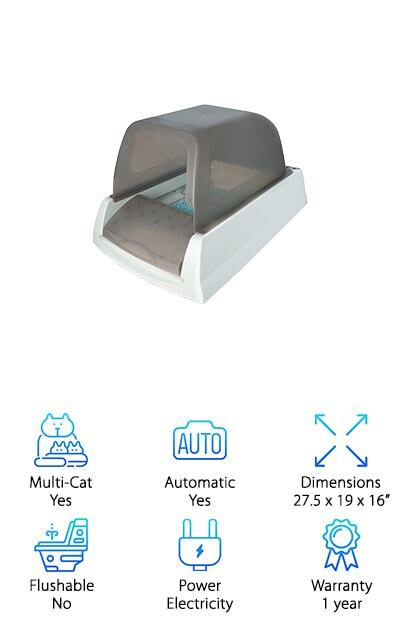 It also has an adjustable timer to automatically rake everything in with different timing options and safety sensors that will reset the timer when the cat enters. 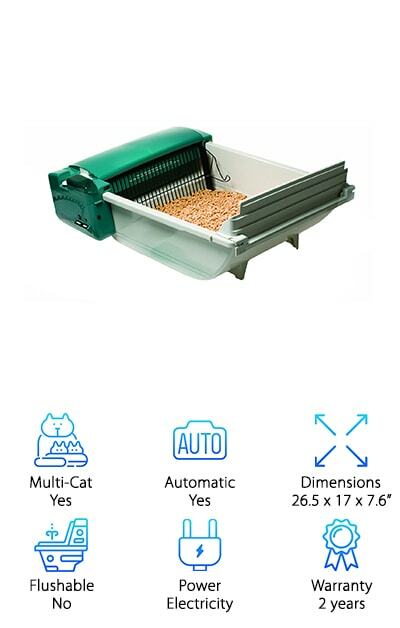 The PetZone Smart Scoop Litter Box uses metal gears, which means that it’s definitely going to stand up to a lot of use and provide you with self-cleaning litter box best features. You can use any type of clumping litter that you want and you’ll be able to get the scooping action that you need without wasting excess litter. It’s over 4 times quieter than other brands, which means even when your cat uses the litter box late you won’t have to worry about being woken up by the system running. When it comes time to clean the box itself you can do it easily because it disassembles with no problem. This system gives your cat 15 minutes after it uses the litter box and then scoops out any mess, storing it in the waste bin behind. All you have to do is open up the waste bin and take out the waste bag. There will always be a clean box when your cat uses it, which keeps them more comfortable and works for multiple cats. If you’re looking for something a little more unique the Le You Pet Litter Box is definitely that. This box is actually raised, which means your cat jumps into it and then it has a litter separation grid that will draw any solid waste into the cleaning box. Sized for up to an 18 pound cat, this box is environmentally friendly as well as non-toxic, plus it’s resistant to moisture and breaking down. All you have to do is put it out of the way and you’ll be able to practically ignore it, just like that. All you have to do is tip it backward to sift any clumps into the back then lower to restore the tray and pull out the small tray to clean it out. The design makes it easy for you to roll but not so easy that your pet is going to roll it on their own. 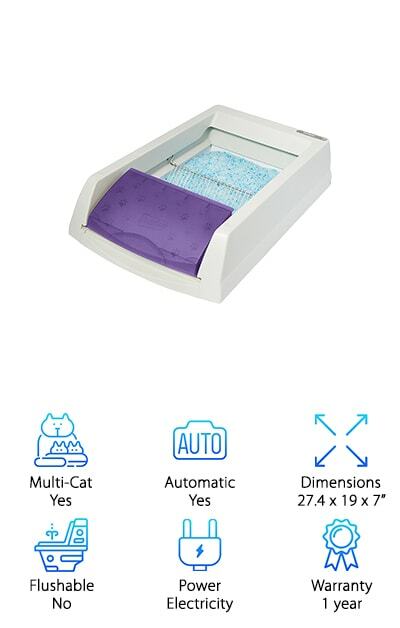 The PetSafe Litter Box is a very unique design but it’s something that will help your cat still feel comfortable but also keep the cleaning process simple. This system gets rid of the need for scooping and the mess. You just need clumping litter and then you can fill it and let it go for several weeks. You plug the box into the wall and the box rotates slowly, making a full rotation each hour. At that point, it filters the mess and keeps it hidden in the waste bin. When it comes time to set it up you’ll have no problem with the process, and even with cleaning it out. Every two weeks you need to empty out the bin into your trash and you’re ready to go for another two weeks. Designed for cats up to 15 pounds, it also helps to keep down the odor and make sure that any waste material is completely out of sight. The Littermaid Litter Box Mega System has everything you need to keep your house cleaner and your litter box less of a hassle. 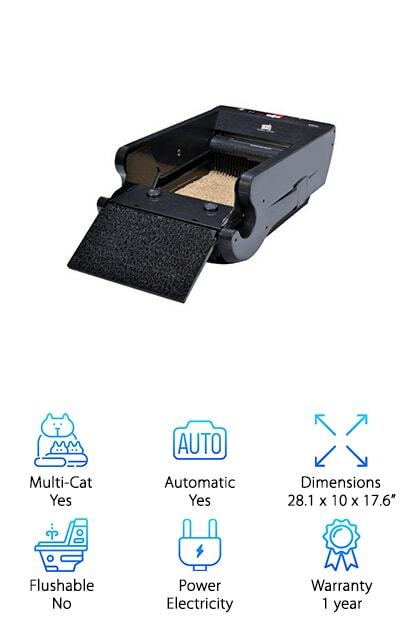 Designed for households with more than one cat or even those whose cats are over 15 pounds, the system has an automatic rake that makes the cleaning process easier. There’s even a safety bar that stops the rake if there’s any kind of blockage so there’s no chance of damage or of harm to your cat. The extra-large bin has high walls so it’s comfortable for your cat and keeps the litter in. The ramp also helps with this, as well as helping your cat in and out. Waste is pulled into a waste bin that you can easily pull out and dump when needed. Each time your cat uses the box it triggers the sensor, which then starts the cleaning cycle (after 10 minutes). This pulls all the waste out of the way. It keeps the bin smelling better and cleaner for your cat. The Our Pets Litter Box actually has a Bluetooth system that helps you better understand your pet’s health and their behavior by sending you notifications if there’s a change. There’s a smartphone app that helps with the process. That means you’ll be able to monitor just how your cat is doing and whether it’s healthy, eating and drinking properly. When it comes to the cleaning it scoops out the waste 15 minutes after your cat triggers the sensor and scoops it into a waste bin. Not only that but there’s a carbon filter in the bin that helps with odor control. All you need is your favorite clumping cat litter and you’ll be ready to go. You’ll also have a two year warranty over the system so you know that it’s going to last. There are lids available that you can purchase separately to keep this even more protected.